Have an old bike sitting in your garage that you never ride? Your used bicycles can make a big difference in the lives of Indy’s homeless community. Started in 2011, our Bicycles for the Homeless Ministry has given out more than 1,700 bicycles. Our homeless neighbors need transportation to get to jobs, medical appointments, social service agencies, etc. We can accept just about any used bicycle as long as it is in ride-able condition. We have volunteers who can make minor repairs. Along with the bikes, we give accessories if they are available through donations: a backpack, helmet and lock, and all bikes are equipped with lights and reflectors. When possible, we like to include useful Items in the backpacks. We observe the recipient riding the bike to ensure ability to safely ride it. 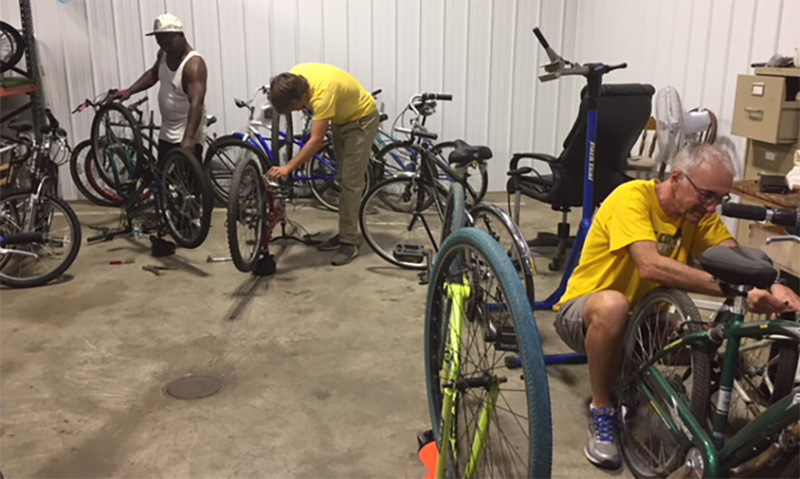 You can drop off your bikes, helmets, locks, and backpacks at the St. Vincent de Paul Distribution Center, 1201 E. Maryland St. Should you have five or more bikes to donate, call Jeff Blackwell, (317) 924-5769, ext. 320, to make arrangements for a pick up during the week. Help us give your bike a second life with an individual who deserves a second chance. Thank you.